Nexia International is a worldwide network of independent auditors, business advisers and consultants. 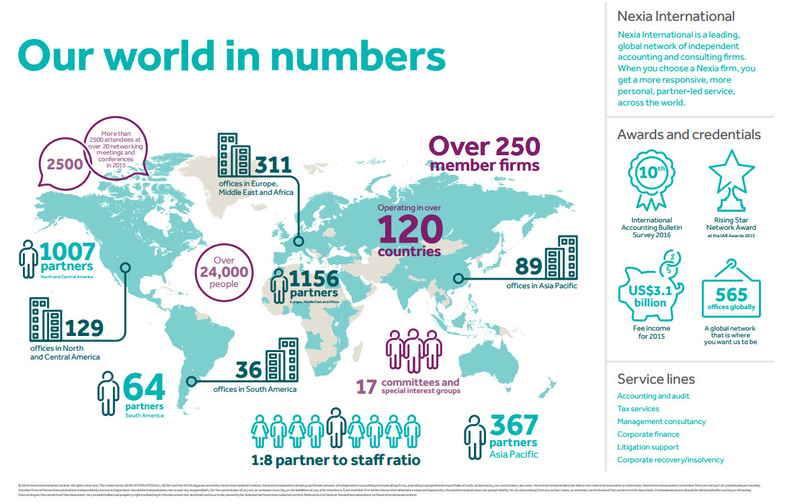 The key to Nexia's success is simple: its global representation with member firms ranking in the top ten in the world's major financial and economic centres. This positioning means that Nexia is able to provide a top quality service to its clients with international needs. Nexia International was founded in 1971 by two firms - Oppenheim Appel Dixon & Associates, USA and Spicer & Pegler, UK. These two founding member firms serviced over half the firms in the financial sector in the major centres of London and New York. Apart from the global firms, no other network has this pedigree. From 1971 to the present day, one of Nexia's greatest strengths has been the willingness of its independent firms to share their partners' expertise and knowledge on behalf of the network's clients. Nexia can also boast a proud tradition of passing on its partners' knowledge, notably in the fields of tax and IFRS, to the public via its various publications. Nexia members have the chance to exchange ideas regularly at regional meetings as well as at the annual tax conference and annual general meeting. In particular, Nexia attaches great importance to the education of its younger members - sponsoring programmes for tomorrow's leaders and seminars for managers. Every client expects high standards from a professional firm. Nexia endorses the quality of its firms by conducting regular Quality Control Reviews. All its member firms must belong to their local Professional body. Whenever you do business in a foreign country, local advice and expertise are vital. As a client of a Nexia International member firm, you will receive the guidance you need, the attention you deserve at a price you can afford.